This year, I am hitting a major milestone in my journey as a kind-of-American. I am nearing my five year anniversary of entering the country. Can you believe it has gone by SO quickly? It only feels like yesterday that the got the envelope with “You have won a Green Card!” in the mail. Because I am nearing five years, it means I qualify to start the process to become a citizen. We’re getting there! On Friday, I mailed off my naturalization application, cheque/check, some more passport photos and a copy of my Green Card. 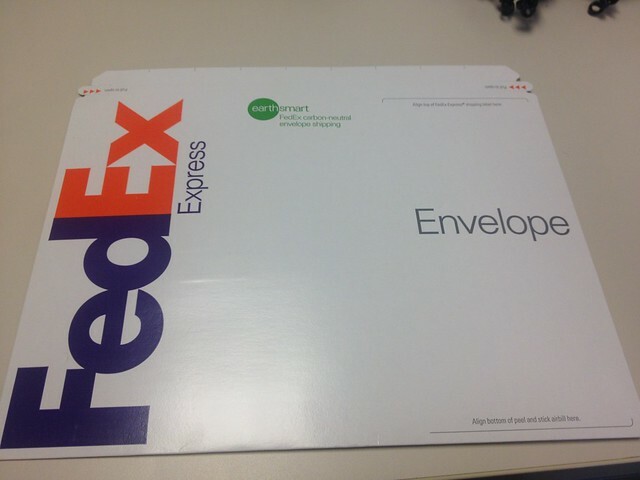 My life and future nationality really is in this FedEx envelope. I am looking forward to voting, being a real voice in local politics and also JURY DUTY! The only time I was ever called to serve was in Australia was when I was living in London. I just NEED to be a on a jury to say I have done it and to quell my fascination with being called to serve. I have to get it out of my system! So, this is a big time for me. In other parts of the country this whole process usually takes three months. Here, it is longer because of the amount of immigrants. This is something I hope to take up with our own Senator Schumer and Senator Gellibrand. We pay the same fees as everyone else in the country and yet, are almost held to ransom by the USCIS. It is hard to explain, but the process is stressful. The uncertainty, the waiting, the hoping and again… the waiting. Much like the Green Card process, it is almost like your life is on hold. Becoming a citizen is something that should be encouraged and made as stress free as possible. If you are filing in New York, it is the exact opposite. Oh, and no, you have no choice where you become a citizen or where you file. Now, for a confession. Every time I think of being a citizen and being American, this song comes into my head and stays for way too long!